I've been feeling the itch for a mass exodus of my stuff again. It's so easy to let piles rise and allow STUFF to creep back into our home. While I've managed to contain my closet, I'm still learning to tame the beast of the kitchen utensils, piles of mail, and miscellaneous cups (where do they come from??). It's important to create a habit of clearing out. With my closet, nothing comes in without reassessing what I can get rid of. This keeps my closet at a fairly consistent number and makes me devoted to an item before I replace an oldie. In other words, I'm super picky. It has to fit me, be comfortable and go with the other items in my closet. On top of all that, I have to love it. If the sound "meh" comes out of my mouth ~ the item is gone! With a small wardrobe, there is no room for mediocre; everything must be adored. It's the same for every area of our life. Whether it's relationships, items, or purpose, we have to be consistently clearing out and reevaluating the significance of what we allow in our lives. We are the curator of our future selves. We alone determine the forecast of who we allow to influence us, what price our things place on us, and how meaningful our lives will be. I'm trying to form the habit of simplicity with my home right now, but I'm still letting the "meh" stuff in. As Marie Kondo puts it, the "just because" stuff. We don't know why it's there, we don't particularly love it, but we keep it just because. We don't know what else to do with it so we stuff it in a junk drawer or in the back of a closet and try to ignore it. The problem is, it grows and weighs us down, It's not important but we let it eat at our time, our energy and our resources. We must hang onto the most important and let go of the mediocre. Letting go of unnecessary items, negativity, and criticism, This is the habit of simplicity. Loosening our grasp on what we don't need so we can fully embrace what we do need. It's only after letting go and forming a habit of simplicity that we can bask in roomy closets, spend long afternoons with a dear friend and engage in meaningful pursuits. 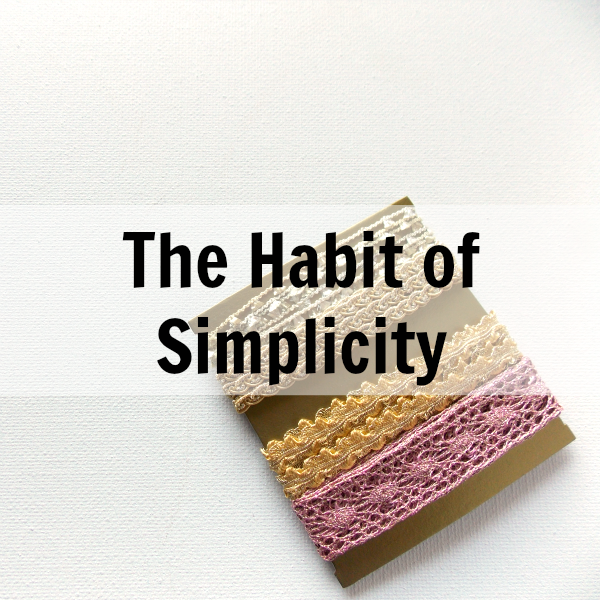 Where would you like a better habit of simplicity?